Udacity threw a wrench in the MOOC model by abandoning higher ed. What's next? 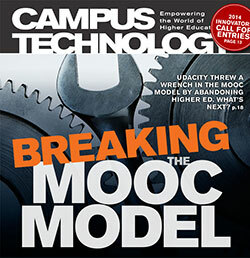 Five IT thought leaders take the temperature of the biggest tech trends in higher education. Students at USC can stream lectures and interact with their peers, all on a mobile device. Social learning tools tap the expertise of individual users, cutting back on help desk requests. Online tech gives students instant access to advisers and tools to help them succeed. CUNY faculty members are using student response software to keep students engaged.